The Milwaukee Brewers just saw their playoff hopes take a noticeable hit. On Monday, the club announced that starter Brent Suter has a torn ulnar collateral ligament in his elbow. The injury sent him straight to the DL and will likely force Suter to undergo season-ending Tommy John surgery. The injury could end up costing Suter all of 2019 as well. It’s yet another injury to Milwaukee’s rotation, which has struggled to stay healthy this year. Suter went to the DL earlier this month with forearm tightness. He returned to make one start before the all-star break and started again on Sunday. However, the lefty felt pain during Sunday’s loss to the Dodgers and was immediately taken out of the game. An MRI performed Monday revealed the torn ligament. This is not a good time for Suter to go down with an injury. The club is 2-9 in their last 11 games going back before the all-star break. Milwaukee has now fallen 3.5 games behind the Cubs in the NL Central. On the plus side, the Brewers sit atop the National League wild-card standings. However, Milwaukee’s margin for error is thin, as there are three teams within two games of them. As mentioned, Milwaukee’s rotation is hurting right now. Junior Guerra was placed on the DL earlier this month with forearm tightness, although he is returning on Tuesday. 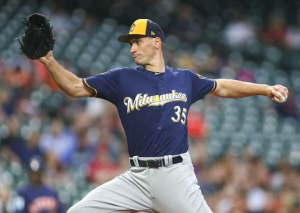 Zach Davies has been on the DL since late May with a rotator cuff problem. Finally, Jimmy Nelson is yet to make his season debut after undergoing shoulder surgery last September. With Davies, Nelson, and now Suter, the Brewers are unsure if they’ll be back at all this year. On the season, Suter is 8-7 with a 4.44 ERA in 18 starts and two relief appearances. Those numbers are a bit of a drop-off from last year when Suter posted a 3.42 ERA. However, Suter was strong throughout May and June and only began to struggle in July when his elbow began to fail him. With Suter joining the other Milwaukee starters on the DL, the Brewers are now looking to Chase Anderson and Jhoulys Chacin to anchor their rotation. Both are having strong seasons with ERAs under 4. Wade Miley has also been good since returning from an oblique injury earlier this month. However, amidst a sea of injuries, it’ll be tough for that trio to keep the Brewers in a position to reach the postseason. The Brewers have already been rumored to be looking for a starter on the trade market. But the loss of Suter and the uncertainty surrounding Guerra, Davies, and Nelson increases Milwaukee’s urgency to make a trade. Merely adding a back-end starter may not be enough for them. If the Brewers can’t add a frontline starter before the deadline, it’s tough to envision them making the playoffs.